Have you ever tried carrying out experiments on air pressure at home? Let's see how we can inflate a balloon inside a bottle. 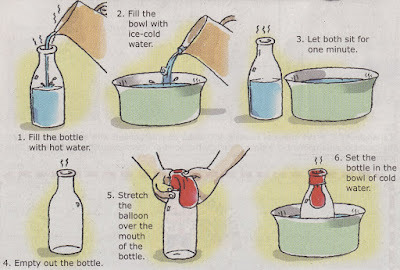 Inflate a balloon inside a bottle? Is that possible? All you need is a bottle, a bowl, some hot water, some ice-cold water and a balloon. Now, let's start the experiment. Fill the bowl with the ice-cold water. Let both sit for one minute. Stretch the balloon over the mouth of the bottle. Set the bottle in the bowl of cold water. This is what you would observe... an inverted inflated balloon in the bottle! How do we explain this phenomena? First of all, air contracts and takes up less room when cooled. Similarly, it expands when it gets hot. The hot water heats the bottle. When the bottle is poured out, the heated bottle then heats the air in it. When the bottle is placed in the bowl of cold water, the air inside the bottle cools and contracts, causing the air pressure inside the bottle to decrease. When this happens, the higher air pressure outside the bottle causes the air outside to be drawn in, pulling the balloon in and inflating it inside the bottle.